The hotel offers a restaurant. A bar/lounge is on site where guests can unwind with a drink. Public areas are equipped with complimentary wireless Internet access. This luxury hotel also offers a 24-hour fitness center, tour/ticket assistance, and multilingual staff. Parking is available onsite for a surcharge. 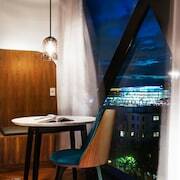 West Hotel Sydney, Curio Collection by Hilton is a smoke-free property. 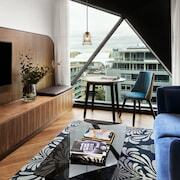 Located in Sydney Central Business District, this luxury hotel is within a 10-minute walk of King Street Wharf, Cockle Bay Wharf, and Pitt Street Mall. Barangaroo Reserve and Queen Victoria Building are also within 15 minutes. Wynyard Station is 5 minutes by foot and Martin Place Station is 12 minutes. This smoke-free hotel features a restaurant, a 24-hour fitness center, and a bar/lounge. WiFi in public areas is free. Other amenities include self parking, 24-hour room service, and conference space. All 182 rooms feature thoughtful touches like espresso makers and pillow menus, along with conveniences such as refrigerators and coffee makers. Guests will also find 24-hour room service, WiFi, and LCD TVs. West Hotel Sydney, Curio Collection by Hilton offers 182 forms of air-conditioned accommodation with espresso makers and a safe. A pillow menu is available. Fridges and coffee/tea makers are provided. Bathrooms include complimentary toiletries and a hairdryer. This Sydney hotel provides wireless Internet access for a surcharge. LCD televisions are featured in guestrooms. Additionally, rooms include complimentary bottles of water and an iron/ironing board. Housekeeping is provided on a daily basis. 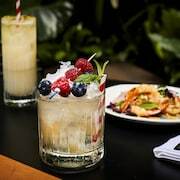 Solander Dining – Overlooking the garden, this restaurant specialises in Modern European cuisine and serves breakfast, brunch, lunch and dinner. Open daily. 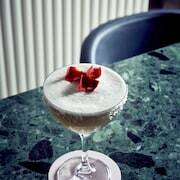 Solander Bar – Overlooking the garden, this bar only serves light fare. Open daily. Rollaway/extra beds are available for AUD 75.0 per stay.